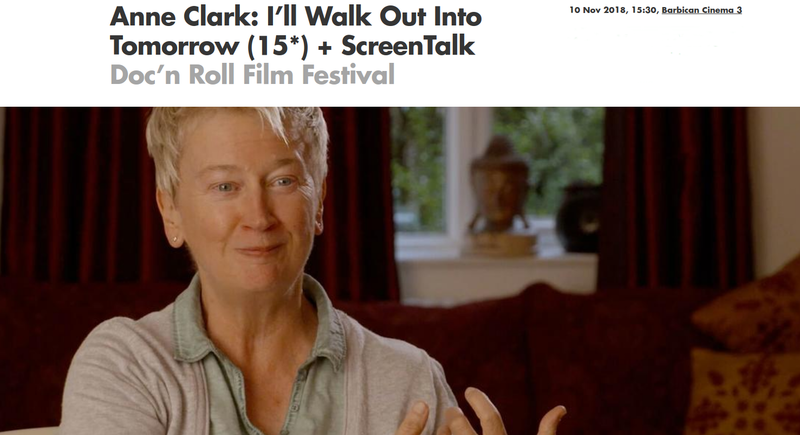 I’ll Walk Out Into Tomorrow was at the Doc’n Roll Film Festival in the Barbican cinema in London. Poet Anne Clark turned punk’s creative heat into eloquently cool soundscapes, whose influence, three decades on, is still felt among musicians in Europe and beyond. Via her ground-breaking use of samples and analogue synthesisers in tracks such as ‘Sleeper in Metropolis’ and ‘Our Darkness’, the Croydon-born Anne Clark became a forerunner of the techno generation. She explored acoustic and orchestral settings for her own simultaneously heartfelt and cryptic lyrics, as well as the verses of poets including Rainer Maria Rilke and Charles Baudelaire. This intimate portrait of a famously reticent figure attests to the patience and keen eye of filmmaker Claus Withopf, who accompanied Clark for nearly a decade. With live footage dating from the 1980s, the documentary focuses on Clark’s recollections of her school days, London’s punk scene, the music industry’s manipulations, the wilfulness of the human heart, and her enduring love affair with the creative process in all its doubts, detours and discoveries.